On Monday, the Court handed down its second opinion of the 2015 Term, Mullenix v. Luna. The map above displays the all the Supreme Court cases cited by the per curiam majority opinion as well as by Justice Sotomayor in dissent. (Click on the image to get a full-sized version of the map with links to all the underlying opinions). In my next post, I will discuss the substantive merits of the decision. For now, those interested in the technical side of map creation might wish to know the following: I made the map in two simple steps. First, I instructed the software to link the cases cited in Mullenix back to either (a) Harlow v. Fitzgerald, a seminal 1982 immunity case; or (b) United States v. Place, an important 1983 4th amendment case. It turns out that this simple heuristic picked up ALL the cases cited by Mullenix except two — Reichle v. Howards (2012) and Plumhoff v. Rickard (2014). Second, I added Reichle and Plumhoff to the map by hand. 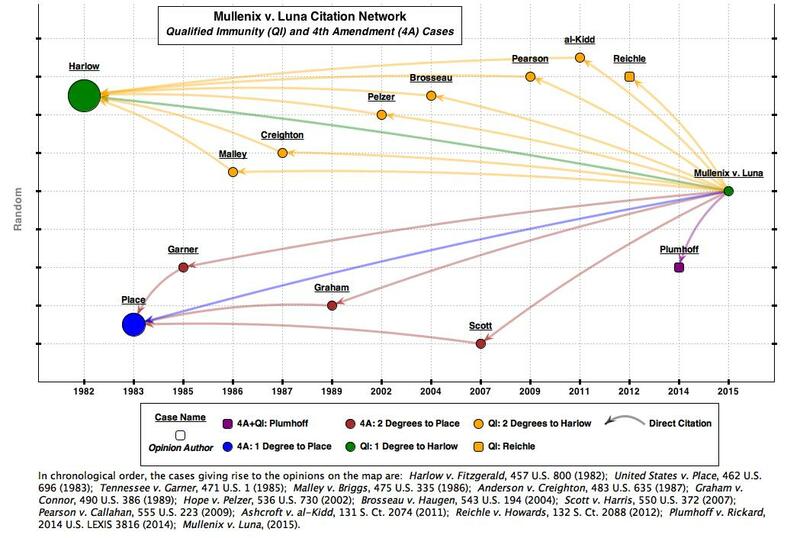 One might predict ahead of time that an early-in-the-term per curiam decision would have a relatively simple citation network. This map confirms that intuition.